When I’m traveling, I always like to keep a light jacket or sweater on me – I tend to get chilly on planes. I’m sure some of you can relate! Last week when I was shopping for my Cali trip, I found this Zara gem of a jacket heavily marked down during their sale. I think I got it for $59! While it’s not available online, there were several of these jackets at the Dallas Galleria, so I’d check your local Zara to see if there are others still available. The casual and comfortable fit make it ideal for long travel days, while the fashion-forward print and pretty color combo enable it to go from day to night with just a simple switch of accessories. I wore these jeans, my Chanel sandals (similar pair here) and my Smythson tote on the plane, but once we got into Carlsbad, I changed into these shorts, a pretty pair of burgundy pumps and my Gucci crossbody for a more fun night-out look. When we first arrived in San Diego, we hopped on over to Hotel Del Coronado for lunch – if you’re unfamiliar, Hotel Del is home to where Some Like It Hot was filmed back in the 50’s! It’s a grand old hotel with a lot of history (and chock full of tourists, unfortunately). After a yummy lunch (I had a huge crab cake BLT – insane! ), my sister and I stopped in the Museum of Contemporary Art before driving north to Carlsbad. Since we were all two hours ahead still, it was a rather early night for our whole group. Sadly my vacation ends tomorrow – I’m heading back on a 1:50pm flight to Dallas! More to come from my trip next week – hope you all have a wonderful weekend! Love these shoes with this jacket. Perfect pairing. You look gorgeous, love this blazer and you pumps are FAB! Have a great weekend. What a great little jacket you have there! Love it with those shorts! Happy Friday! That’s beautiful jacket!! And your heels…perfect!! This has to be one of my favorite outfits you’ve ever posted!! It’s very much something I would wear and I just adore that jacket! California agrees with you! You look amazing! That light weight jacket is a great closet addition. For travel or for a cool fall night… its a beauty! Happy Friday! Those Rag & Bone shorts are perfect! They’re so versatile, they’re very flattering and they look super comfy! That jacket is divine. Loving those burgundy pumps! Such a chic California look. This jacket is so fun! I love it! That jacket is so pretty and I love your pumps! Enjoy the rest of your time in Cali! Such a great find! The jacket is fabulous and the sunnies look perfectly on you! Have fun in the rest of your holidays! Love your style lady! That jacket is amazing! Love, love, LOVE those shorts! Love the jacket- the colors are great and I agree, I always need a jacket for planes! That jacket is gorgeous! The colors are making me anxious for Fall! That jacket works so well with the denim cutoffs! Super cute! LOVE THIS! 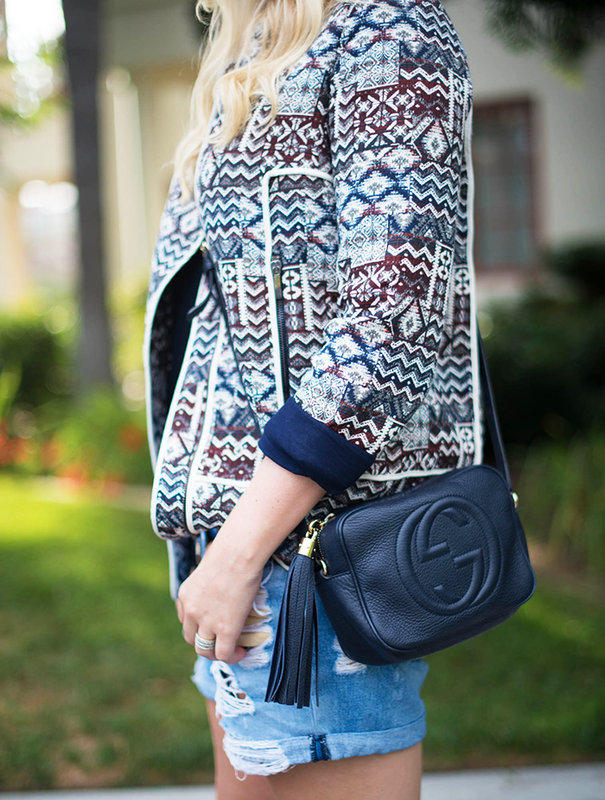 the denim, the print, all of it. Ive wanted to do something like this. Love this outfit!! The jacket and shoes are amazing! Love the jacket and shorts. It’s the perfect outfit. What a beautiful jacket. 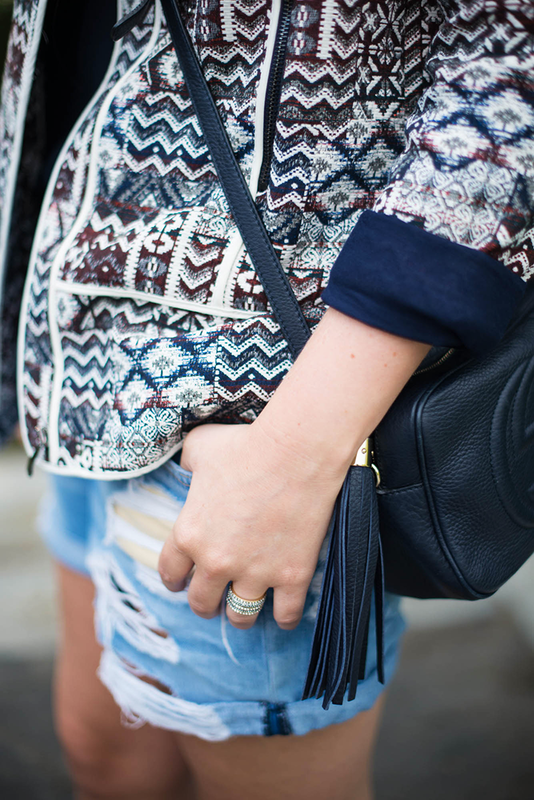 I love how you mixed the elaborate jacket with your more laid back denim shorts! obsessedddd…did I already comment? hahah I have been wanting to do this look I just cannot find a jacket I love! p.s look you can do cool stuff with you hair too!